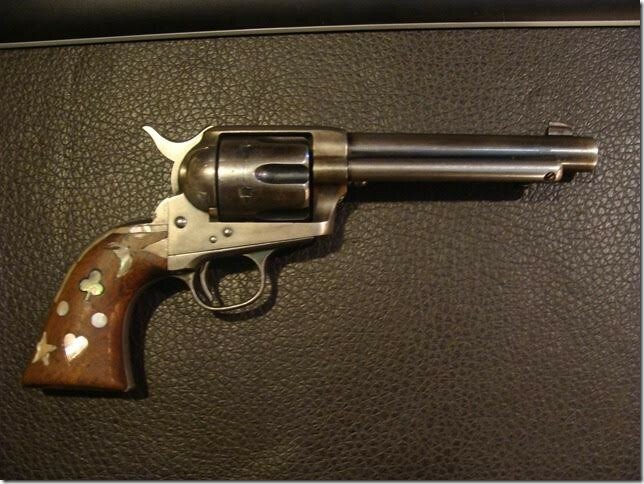 This Colt Model 1873 Government Contract Single Action Army Revolver with “Artillery” modifications. The Colt Factory Letter, that accompanied this revolver, states that it was part of a lot of 200 pistols sent to the U.S. Government Inspector at the Colt factory on January 31, 1877.
on the loading gate and is stamped with the assembly number “5294” / “C” Colt inspection mark is stamped on the inside of the hammer well. Comes with Colt Letter and Certificate of Authenticity. This Colt Model 1873 Government Contract Single Action Army Revolver with “Artillery” modifications. The Colt Factory Letter, that accompanied this revolver, states that it was part of a lot of 200 pistols sent to the U.S. Government Inspector at the Colt factory on January 31, 1877. The revolver was subsequently overhauled and had the 7 1/2” inch barrel shortened to 5 ½ inches by Colt Armory. In addition to the shortened barrel, it was common that all of the revolver’s would be reassembled using mixed parts which gave different serial numbers to each revolver. This practice was totally typical to do on all artillery model revolvers by military. This Revolver frame is numbered “34528” which gives it the Manufacturing date of 1877 and stamped with the initials of the Ordinance Inspector John T. Cleveland (J.T.C.). Who is one of the most rare Inspector marks to be found on any Colt revolvers. The barrel is stamped with the serial number “1276” and stamped with two “P” proof marks and the Inspector initials “D.F.C.” for Dwight F. Clark. The trigger guard and back strap are serial numbered “119413.” The side of the cylinder is stamped with the serial number “786” which is common and correct and also with the inspector initials “D.F.C.” the rear face of the cylinder is stamped with two “K” inspection marks, a “B” and an “O” on the loading gate and is stamped with the assembly number “5294” / “C” Colt inspection mark is stamped on the inside of the hammer well. The top of the barrel is roll-stamped: “COLT’S PT.F.A.MFG. Co. ARTFORD CT. U.S.A.” in one line. The left side of the frame is roll-stamped with Colt’s ‘three dates in three line patent / correctly marked and followed by what is commonly referred to as “martially mark “U.S.” on the left side of the frame. The left side of the grip is inlaid with 7 (seven- “mother of pearl-shells inlays” displaying a Card Motif of “a Spade” and “a Diamond.” The right side of the grip also has 7 (seven mother of pearl inlays including “a Club,” and “Heart.” Plus a five-point pearl “Star.” Several pearl inlays on the upper right side of the grip appear to be an attempt to fill a chip between the grip and back strap. In addition to the Colt Factory Letter, the Revolver is accompanied by a “Certificate of Authenticity” that describes the revolver and states that it was both “personally owned and used by Cowboy Star, Roy Rogers, known as the King of the Cowboys and has been on display inside The Roy Rogers –Dale Evans Museum.” Comes with Colt Letter and Certificate of Authenticity. Please email cowboycabin@centurytel.net with questions or call 406 270-2842.